For my 30th birthday I spent a few days being silent by myself. It was the perfect time to go, because I’ve been feeling overwhelmed a lot recently-like everyone else in America- with the ever-rising tide of technology to respond to, trying to be a good person, trying to be a good friend. Having the time to disconnect from everything for a bit showed me that that I had been suffering from a lack of magic in my life in exchange for the ever-onward rush to check things off a to do list. But wonderfully, it took just a day or too of sitting around doing nothing, watching the rain and the clouds and sunrises to feel much more like we live in a mysterious magical world. I felt worried that as soon as I returned, I would go right back to being too busy to be inspired by life. So while I was there, I made notes about little rituals or habits I could use at home to harbor a sense of wonder and magic. Of course I will get stressed out and busy now that I’m home, but I’m testing these ideas out to see which ones help me pay attention to the world, and offer a pause in the day. Maybe some of them will be helpful for you too? I would also love to hear your ways of offering yourself some wonder in in the day! Paint some blobs on a page, and then decorate them like they’re the most special blobs. Go to a church/mosque/synagogue/temple that you know nothing about and sit for a service. Try one technology-free day per week, or one technology free hour! Use the app “Forest”, it keeps you from looking at your phone in a really sweet way. You plant a tree on your phone, and if you look at your email or Facebook, or any other app during a certain time, the tree dies. You can grow a whole forest of trees if you focus. 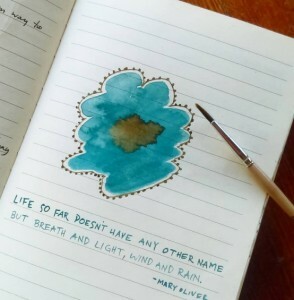 Write out a favorite quote in a fancy way and illustrate it. Keep a piece of Labradorite in your pocket. It is certainly the most magical-looking stone.